It's that time of the month again when Cheryll hosts FNWF and we all get down to a little or alot of crafting. I've been busy making bunting for the garden during the day, but in the evening I was finishing off the last bits for my Christmas In July swap which I'll blog about when my partner has received them. I also got a lovely bouquet of flowers from my DH which was totally unexpected. 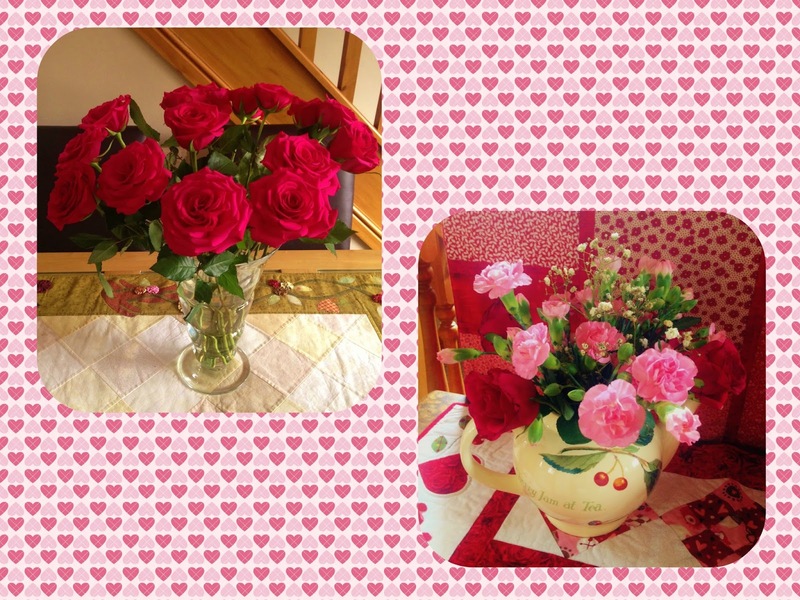 I love the flowers in the teapot they look beautiful on the landing at the top of the stairs. Why not pop over to Cheryll's and see what we all got up to. Love your garden and your gorgeous bunting! It looks so pretty. Lovely flowers too - what a sweetie! The bunting looks wonderful in your beautiful garden. What a sweet husband, they are indeed beautiful flowers, I love how you have them arranged in a teapot. Looks like you have been having fun! How are you getting on with the big striped blanket - is it finished yet?? Love your garden bunting and the flowers from your DH are lovely.